Draft: 2007, Cincinnati Reds, 1st rd. In 2014 was named to his first All-Star team by National League manager Mike Matheny, finished 21st in the Baseball Writers' Association of America's NL Most Valuable Player Award voting and joined Johnny Bench as the only catchers in Reds history to produce at least 25 HR and 80 RBI in a season...shares the franchise record for consecutive apps with a home run (5g, 6/19-6/24, 2014) and from 2014-2016 shared the club record for grand slams in a season (3, 2014) until Scooter Gennett hit 4 grand slams in 2017...following the 2015 and 2016 seasons was nominated for the Phi Delta Theta Lou Gehrig Memorial Award for his character and leadership both on and off the field...in 2011 received the Mary E. Barney Award as Louisville's Most Valuable Player, was an International League and Baseball America Class AAA All-Star and participated in the Sirius XM All-Star Futures Game at Ari's Chase Field...following the 2011 season was rated by field managers as the best defensive catcher in the International League...in 2010 received the Sheldon "Chief" Bender Award as the organization's Minor League Player of the Year...was the Reds' first-round selection (15th overall) in the June 2007 draft...at the time was just the third catcher ever taken by the Reds with their top pick (Dan LaMar in 1979, Dan Wilson in 1990)...in 2007 was Pennsylvania's Gatorade High School Player of the Year...because of 5 stints on the disabled list, over the last 3 seasons has been limited to 95 apps and 57 starts for the Reds. In 2007 graduated from Punxsutawney (PA) Area High School, where he set school career records for walks (91), runs (122), hits (101), doubles (25), home runs (18) and stolen bases (35)...also set school single-season records for walks (31, 2007) and runs scored (40, 2005)...as a senior was named Pennsylvania's Gatorade Player of the Year. Made 56 apps and 39 starts around 3 stints on the disabled list (left shoulder/right hip, left shoulder, left foot)...began the season on the 10-day disabled list while recovering from 2016 surgeries to repair a torn labrum in his left shoulder (5/10) and to repair labral and bony abnormalities in his right hip (7/18)...came off the DL on 4/27 after 13 apps and 20 rehabilitation days (4/6-4/25) at Pensacola...on 4/28 at StL started in his first appearance for the Reds since 4/27/16...from 7/5-7/18 was disabled a second time with a left shoulder strain...before he was activated on 7/19 made a pair of rehab apps for Louisville and produced 1 hit, a grand slam off Syracuse's Sean O'Sullivan...didn't play after 8/14, when at Wrigley Field he suffered a broken left foot when he was hit by a Jose Quintana pitch...beginning the next day finished the season on the disabled list...leading off the 10th inning of the 3-2 win on 6/2 vs Atl, snapped a season-high 0-for-15 skid with his first career walkoff HR (off Jose Ramirez)...in the top of the 10th inning of the 6-5 loss on 8/12 at Mil was ejected from the dugout by 3B umpire Larry Vanover for protesting a foul tip strikeout of teammate Adam Duvall...was his second career ejection...on 8/6, Devin and wife Kira celebrated the birth of their first child, son Luke Devin. Made 16 apps and 13 starts before he suffered a torn labrum in his left shoulder...had season-ending shoulder surgery on 5/10...on 7/18 had surgery on his right hip to repair labral and bony abnormalities...the procedure was performed in New York by hip specialist Dr. Bryan Kelly, who also repaired an impingement in Mesoraco's left hip in June 2015...made his last appearance in a start on 4/27 at NYM...on 5/2 went on the 15-day disabled list with the shoulder injury...on 5/7 was transferred to the 60-day DL. On 6/29 had season-ending surgery to repair an impingement in his left hip...hip specialist Dr. Bryan Kelly repaired the torn labrum and removed a spur...made just 23 apps for the Reds, including all 5 of his starts at catcher in the team's first 5g of the season through 4/11...became the first catcher to start each of the Reds' first 5 games since Jeff Reed in 1989...early in the season was bothered by discomfort in his left hip and from 4/13-4/15 missed the series at Wrigley Field while receiving treatment in Cincinnati...following an appearance as a defensive replacement behind the plate on 4/12, didn't play again until a pinch-hitting appearance on 4/21...made his last 17 apps of the season as a pinch hitter (13g) and designated hitter (4gs) before he went on the disabled list on 5/25...made his last appearance of the season as the designated hitter on 5/20 at KC and his last start behind the plate on 4/11 vs StL...on 6/8 was sent to Louisville on a rehabilitation assignment but made only 3 starts, all in LF, before he was sidelined again with soreness in the hip...were his first professional apps at a position other than catcher...on 6/12 was returned from the rehabilitation assignment and had surgery 17 days later...on 7/20 was transferred to the 60-day disabled list...as a pinch hitter in the 4-3 win on 5/12 vs Atl produced his first career walkoff hit, an RBI-double off Jason Grilli. Was named to his first All-Star team by National League manager Mike Matheny...finished 21st in the BBWAA's NL Most Valuable Player Award voting...led all Major League catchers in HR and RBI...joined Johnny Bench as the only players in Reds history whose primary position was catcher to produce at least 25hr and 80rbi in a season...Mesoraco's 24hr as a catcher were the most by a Red since Bench hit 30 at that position in 1977 and his 76rbi at that position were the most by a Red since Eddie Taubensee had 87 (21hr) in 1999...with 440 plate apps, Mesoraco became become only the third catcher in Major League history to produce at least 24hr and 76rbi in 450 plate apps or fewer, joining LAD's Mike Piazza (24hr, 92rbi in 1994) and Tex' Ivan Rodriguez (27hr, 83rbi in 2000)...from 6/19-6/24 homered in 5 straight apps (5hr, 12rbi), tying the club record (6th time, most recently by Adam Dunn in May 2008)...hit 3 grand slams, also tying the club's single-season record (6th time, most recently by Chris Sabo in 1993)...despite 2 stints on the disabled list (3/30-4/6 with a strained oblique, 4/26-5/15 with a strained left hamstring) still tied Todd Frazier for the team lead in RBI, ranked second to Frazier in HR and tied for the club lead in doubles...established career highs in most statistical categories...in the batting order hit third (2gs), fourth (53gs), fifth (19gs), sixth (15gs), seventh (15gs) and eighth (1gs on 4/8 at StL in his season debut)...hit safely in each of his first 11 apps of the season, a career high hitting streak and the longest by a Reds batter to begin a season since Barry Larkin began the 1995 campaign with a 12-game hitting streak...his .541 average through his first 10 apps was the highest by a Reds batter over his first 10 apps (20ab minimum) since Bubbles Hargrave went 12-for-22 (.545) in 1926...in the span covering his first 13 apps overall, he led all Major League hitters in batting average (.468) and on-base percentage (.509) and ranked second in slugging percentage (.787; Albert Pujols 1st, .806) before he was disabled again with the hamstring injury...returned from his second DL stint on 5/16 and in that night's 3-0 win at Phi hit a 3-run HR off Kyle Kendrick in his first plate appearance...on 4/8 at StL made his season debut and doubled in each of his first 2 plate apps...on 5/19 at Wsh batted cleanup for the first time in his career and became the first Reds catcher to hit fourth since Ramon Hernandez on 5/29/09 at Mil...on 5/27 at LAD made his first career appearance batting third in the order...in the 6-4 win on 5/30 at Ari produced his second career grand slam (off Bronson Arroyo), his second career 2-homer game and 5rbi...joined Andy Seminick, Smoky Burgess and Bench as the only catchers in Reds history to hit 2 homers, including a grand slam, in the same game...in the 7-2 win on 8/10 vs Mia had 2 homers, including a grand slam, and a career-high 6rbi, the most by a Reds batter in a game all season...his record-tying 5-game home run streak was extended on 6/23 at Chi by a grand slam off Hector Rondon with 2 outs in the ninth inning and on 6/24 at Chi by a homer off Neil Ramirez with 1 out in the ninth...also during that streak, from 6/19-6/23 became the first player in Major League history to produce in 4 consecutive games and in succession a solo HR, 2-run HR, 3-run HR and grand slam...the bat he used during the 5-game home run streak was sent to the Cooperstown Hall of Fame...on 8/29 at Pit singled to lead off the seventh inning and break up Edinson Volquez' no-hit bid...during spring training didn't play after 3/17 because of the oblique injury and missed the Reds' first 6g of the regular season. Led the team in starts at catcher (84) and innings caught (782.0), both career highs...Reds pitchers went 46-38 in his starts and posted a 3.40era when he caught...threw out 13-56 baserunners attempting to steal (23%)...caught 2 of the staff's 5 complete games and 7 of its 17 shutouts...was bothered by a sore back early in July and on 7/8 at Mil caught the entire game as the Reds' only healthy catcher...as a pinch hitter in the 5-4 win vs Atl on 5/7, with 2 outs in the ninth inning homered off a 3-2 pitch from Craig Kimbrel to tie the score at 4-4 and then Shin Soo-Choo followed with another homer to win it...was his first career pinch-hit HR...in the 8-3 win on 8/3 vs StL produced his first career 2-HR game (3rbi)...in the 11th inning of the 6-4 win on 6/29 at Tex snapped the 4-4 tie with a 2-run HR off Kyle McClellan, his first career extra-inning homer...in the 10-inning, 6-5 win on 9/20 at Pit produced a 2-out, 2-run single that tied the score at 5-5...caught the last 2 innings of the 6-2 Wild Card playoff loss at Pit. His 5 homers were the most by a Reds rookie catcher since Dann Bilardello hit 9hr in 1983...Reds pitchers posted a 24-24 record in his 48 starts and a 4.19era while he caught ... on 8/21 and 8/22 served a 2-game suspension for his actions on 7/30 vs SD, when he was ejected by HP umpire Chad Fairchild ...originally was suspended for 3g ... earlier in that 7/30 game suffered a concussion in a collision at the plate and from 8/1-8/8 was on the 7-day concussion disabled list ... on 8/23 was reinstated from the suspension list and optioned to Louisville ... made 5 apps there before he returned to the Reds on 9/2 and made 2 apps the rest of the season for Cin ... on 5/24 vs Atl and 5/26 vs Col homered in consecutive games (2hr, 5rbi) ... in the sixth inning of the 6-3 win vs Atl on 5/24 erased the 2-1 deficit with his first career grand slam (off Kris Medlen) ...on 6/24 vs Min recorded his first career stolen base ... 3 times was used as a pinch runner...was not on the Postseason roster ... entered the 2012 season rated the organization's top prospect. In his Major League debut made 18 apps and 13 starts as aSeptember callup...started each of the Reds' last 5g and 9 of their last 11g...Redspitchers posted a 4.78era while he caught and went 7-6 in his 13 starts...threw out 2-9 baserunners attemptingto steal (22%)...on 9/3 at StL made his Major League debut as a pinch hitter and doubled on Mitchell Boggs' firstpitch...hit his first career homer on 9/12 vs Chi (solo off Rodrigo Lopez)...on 9/1 was recalled from Louisville,where he received the Mary E. Barney Award as the club's Most Valuable Player...was an International Leaguemid-season and post-season All-Star and a Baseball America Class AAA All-Star...also participated in the XMAll-Star Futures Game at Ari's Chase Field...was rated by field managers as the best defensive catcher in theInternational League...led the Bats in doubles, total bases and walks and tied for the team lead in hits...rankedamong the IL leaders in intentional walks (6, T1st), doubles (36, 4th) and extra-base hits (53, T5th)...rankedfourth in the organization in doubles...in the Bats' 8-inning, 5-4 win in the nightcap of a doubleheader on 4/12vs Columbus hit Josh Judy's first pitch for a walkoff homer...homered twice on 8/23 vs Toledo...was ratedby Baseball America as one of the Top 100 prospects in baseball...entered the season rated the third-bestprospect in the organization, behind only LHP Aroldis Chapman and IF Billy Hamilton, and by mid-seasonwas rated the 15th-best prospect in baseball. Became the first catcher to receive the Sheldon"Chief" Bender Award as the organization's Minor League Player ofthe Year...in 113 apps at 3 minor league levels hit .302 with 26hr and75rbi...led all Reds farmhands in HR and ranked among the leadersin hitting (6th) and RBI (4th)...was the organization's Minor League Player of the Month for April...began theseason at Class A Lynchburg, then was promoted to Class AA Carolina on 5/29 and to Class AAA Louisvilleon 8/17...made his Triple-A debut on 8/18 vs Syracuse and hit a walkoff grand slam off Atahualpa Severino,the first walkoff slam by a Bats player since 1994...in his next plate appearance, in the second inning on 8/19vs Syracuse, hit a grand slam off Andrew Kown...became the first player in franchise history to hit grand slamsin consecutive plate apps or on consecutive days...played for the Peoria Seguaros in the prestigious ArizonaFall League (18g, .242, 6 2b, 1 3b, 2hr, 11rbi)...participated in the AFL's Rising Stars Game. Spent the season at Class A Sarasota, where he appeared in 92g...on 8/7 went on the disabledlist with a strained right forearm and didn't play again the rest of the season...entered the campaign ratedthe 10th-best prospect in the organization by Baseball America...at 20 years old was a non-roster invitee toMajor League spring training camp. Played at Class A Dayton in his first full professional season...on 7/10 vs Wisconsin belted his first careergrand slam...had a 2-homer game on 7/21 at Clinton...had a season-high 4 hits on 8/15 at Great Lakes...wasthe recipient of the Dernell Stenson Award as the organization's Florida Instructional League Most ValuablePlayer. Made his professional debut on 6/26 at GCL Twins (1-4, double)...belted his first pro homer on8/3 vs GCL Red Sox (2-4)...following the season was named by Baseball America as the eighth-best prospectin the organization and the 11th-best prospect in the Gulf Coast League. February 7, 2019 New York Mets signed free agent C Devin Mesoraco to a minor league contract and invited him to spring training. 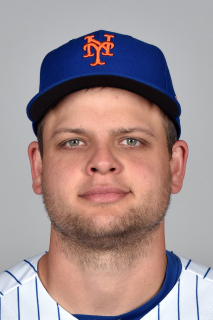 February 7, 2019 C Devin Mesoraco assigned to Syracuse Mets. October 29, 2018 C Devin Mesoraco elected free agency. May 8, 2018 New York Mets activated C Devin Mesoraco. October 2, 2017 Cincinnati Reds activated C Devin Mesoraco from the 10-day disabled list. August 15, 2017 Cincinnati Reds placed C Devin Mesoraco on the 10-day disabled list. Broken right foot. August 10, 2017 Cincinnati Reds activated C Devin Mesoraco from the paternity list. August 7, 2017 Cincinnati Reds placed C Devin Mesoraco on the paternity list. July 19, 2017 Cincinnati Reds activated C Devin Mesoraco from the 10-day disabled list. July 17, 2017 Cincinnati Reds sent C Devin Mesoraco on a rehab assignment to Louisville Bats. July 5, 2017 Cincinnati Reds placed C Devin Mesoraco on the 10-day disabled list retroactive to July 3, 2017. Left shoulder strain. April 27, 2017 Cincinnati Reds activated C Devin Mesoraco from the 10-day disabled list. April 6, 2017 Cincinnati Reds sent C Devin Mesoraco on a rehab assignment to Pensacola Blue Wahoos. April 2, 2017 Cincinnati Reds placed C Devin Mesoraco on the 10-day disabled list retroactive to March 30, 2017. Right hip surgery. October 27, 2016 Cincinnati Reds activated C Devin Mesoraco from the 60-day disabled list. May 7, 2016 Cincinnati Reds transferred C Devin Mesoraco from the 15-day disabled list to the 60-day disabled list. Torn labrum in his left shoulder. May 2, 2016 Cincinnati Reds placed C Devin Mesoraco on the 15-day disabled list retroactive to April 28, 2016. Torn labrum in left shoulder. November 2, 2015 Cincinnati Reds activated C Devin Mesoraco from the 60-day disabled list. July 20, 2015 Cincinnati Reds transferred C Devin Mesoraco from the 15-day disabled list to the 60-day disabled list. June 2015 left hip surgery. June 8, 2015 Cincinnati Reds sent C Devin Mesoraco on a rehab assignment to Louisville Bats. May 25, 2015 Cincinnati Reds placed C Devin Mesoraco on the 15-day disabled list retroactive to May 21, 2015. Left hip injury. May 16, 2014 Cincinnati Reds activated C Devin Mesoraco from the 15-day disabled list. May 13, 2014 Cincinnati Reds sent C Devin Mesoraco on a rehab assignment to Louisville Bats. April 26, 2014 Cincinnati Reds placed C Devin Mesoraco on the 15-day disabled list. Strained left hamstring. April 7, 2014 Cincinnati Reds activated C Devin Mesoraco from the 15-day disabled list. April 3, 2014 Cincinnati Reds sent C Devin Mesoraco on a rehab assignment to Pensacola Blue Wahoos. October 15, 2012 Cincinnati Reds activated C Devin Mesoraco. September 2, 2012 Cincinnati Reds recalled Devin Mesoraco from Louisville Bats. August 25, 2012 Devin Mesoraco roster status changed by Louisville Bats. August 23, 2012 Cincinnati Reds optioned C Devin Mesoraco to Louisville Bats. August 21, 2012 Devin Mesoraco suspended. August 9, 2012 Cincinnati Reds activated C Devin Mesoraco from the 7-day disabled list. August 1, 2012 Cincinnati Reds placed C Devin Mesoraco on the 7-day disabled list. Concussion. September 1, 2011 Cincinnati Reds selected the contract of C Devin Mesoraco from Louisville Bats. July 13, 2011 Devin Mesoraco roster status changed by Louisville Bats. July 9, 2011 Louisville Bats placed C Devin Mesoraco on the temporarily inactive list. January 28, 2011 Cincinnati Reds invited non-roster C Devin Mesoraco to spring training. August 31, 2010 Devin Mesoraco assigned to Peoria Saguaros. August 17, 2010 C Devin Mesoraco assigned to Louisville Bats from Carolina Mudcats. May 29, 2010 Devin Mesoraco assigned to Carolina Mudcats from Lynchburg Hillcats. January 21, 2010 Cincinnati Reds invited non-roster C Devin Mesoraco to spring training. November 10, 2009 Devin Mesoraco transferred to Lynchburg Hillcats from Sarasota Reds. September 16, 2009 Sarasota Reds activated C Devin Mesoraco from the 7-day disabled list. August 9, 2009 Sarasota Reds placed C Devin Mesoraco on the 7-day disabled list retroactive to August 7, 2009. Sprained left wrist.